In case you're still holding out, the time has now come. This is a guest post by Aliza Israel. If you’d also like to guest post here on JobMob, follow these guest post guidelines. Social media has radically altered the process of job hunting. If you’re looking for work and haven’t been converted yet by social media evangelists, perhaps the time has come. Job seekers today need to leverage the opportunities inherent in the new Web; to ignore it is to miss out on what is, potentially, your most powerful job seeking tool. Consider the case of a friend of mine who moved from the U.S. to Israel a few years back. Prior to her move, she used Facebook and built up a large network of friends. She shared with her friends lots of information about her personal and professional life, so that they became aware of her skill set and accomplishments, and they all knew that she was moving and looking for a job. Within two weeks of the move, my friend was already working. She’d had job offers even before she’d packed her bags – all through Facebook. If you relate to the Web purely functionally – the way you might relate, perhaps, to a microwave or telephone – think again. Web 2.0 is an entire culture, or perhaps counterculture, with an almost-messianic philosophy and a bombastic language all its own. Web 2.0 is about mass collaboration, cooperation and participation. Down with upper management and the dictatorial boss; up with conversation, micro-contributions and mutual assistance based on trust. Social networks, blogs, wikis, mashups and RSS feeds leverage collective intelligence and encourage the exchange of ideas across networks, facilitating problem solving through sharing. For example, recently Skype went down and Twitter was overflowing with people tweeting about the problem, until Skype joined the conversation (on Twitter) and told everyone how to fix it. The entire computer-savvy world was on a massive, multiplayer chat. This same professional collaboration can help all of us find our next job. For example, I can contribute directly to my professional community by developing a blog or Twitter feed, thus establishing a sterling reputation and building contacts that open new doors. While traditional business models rely on a vertical power hierarchy, online social networks are inherently horizontal. Mass collaboration is developed through effective interaction across all levels of corporate structures, and centralized power is being challenged and replaced by increasingly powerful networks. This summer, a Facebook group protested the price of cottage cheese in Israel and triggered a response from local dairy industry “tycoons,” who lowered prices. Facebook tells me I’m the 43,435th member to join this group, though news sites claim it already has over 100,000 followers (perhaps multiple groups have the same agenda). These same networks mean that I can directly contact the CEO of a company that’s growing and express my interest in being interviewed for a job. I no longer need the HR department to call me, in order to make contact. The new Web diffuses power towards the edges of society, uncovering and releasing the voice of the individual. In the political sphere, social networking opens up new possibilities for civil participation, as seen in revolutions all over the Middle East this year. On job sites, there is a constant exchange of information that directly helps job seekers learn about opportunities. For example, I’ve seen a job site for engineers, which maintains an online database of interview questions. The questions are categorized according to company name. Engineers who go to job interviews post the questions they were asked, paying it forward and helping the next engineer to come to the interview better prepared. Much like a college fraternity or local synagogue, an online network leads to real-world relationships, opportunities – and, of course, job offers. The majority of us find our jobs through the extended connections of our community networks. According to Fraser and Dutta, social networks function like the Chinese concept of Guanxi – business relationships that work like an extended family or clan. But it’s not just about business. The online community is changing our personal lives, too. My kids never use email; they go on Facebook to see if their friends are getting together tonight. Personal identities in cyberspace are invented and role playing is less constrained by traditional social codes. Individuals have multiple identities and sometimes, the truth is blurred. If you aren’t comfortable with your true identity, create a new one; if you don’t have friends, “Fakebook” – invent them. We create who we want our virtual selves to be. If you’re looking for work, it may be helpful to actively create and develop an online professional identity that puts your best foot forward for all the virtual world to see. The most successful networking sites have an open-door approach. A network, in order to work, needs a critical mass. To understand this, consider the introduction of the telephone at the end of the 19th century. Until the phone became popular, it was not significant; it didn’t become life-changing until a majority of individuals owned a phone. As a job hunter, the sheer size of LinkedIn, Facebook and Twitter helps me successfully connect with almost any company or organization that interests me. If I stay abreast of business news, I can read about the growth of a particular company in the newspaper and then proactively track down any contacts of mine who work there. In this way, I can actually find out about jobs before they’ve even been advertised. In the age of social media, traditional ideas of privacy have been challenged. We’re putting our most personal information “out there” for all to see and, frequently, the personal and the professional clash. Compromising information on the Internet definitely affects professional success; for proof, look no further than Rep. Anthony Weiner’s recent Twitter scandal. Because our society is so Google-based, it is increasingly necessary to manage online reputations and control what information we want a potential boss, customer or business partner to see. If you’re looking for a job, Google yourself and see what comes up. You might be surprised. Be comforted, however, that you can usually manage your online reputation fairly successfully using basic strategies such as creating a personal website, setting up profiles on social media sites and utilizing SEO. In cyberspace, status is not assigned, it is earned. There is a democratization of status online, because status is based on facts that attest to expertise and effectiveness. In the real world, in contrast, status is organized based on a vertical system of values. The old business models leave the power in the hands of “management.” Web 2.0 models involve a loosening of power, allowing employees and customers alike to contribute. It’s a system based on expanded participation, which requires a new degree of trust. Web 2.0 is a revolution. The effects of the new Web can be compared, perhaps, with the 15th century social, political and economic transformations triggered by the invention of the printing press, which absolutely changed the way we work. Social media is changing the way we communicate and connect and, therefore, it’s shifting how we think, build and evolve. 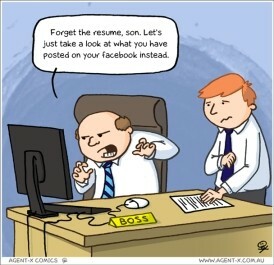 In today’s market, social media is absolutely essential to finding work. If you aren’t using these tools already, you will need to master them, since the alternative may soon be akin to illiteracy. And since the pace of life is way faster now than it ever was, it might be time to jump on the social media wagon and hang on for Second Life. Aliza Israel is a marketing communications and technical documentation consultant, and owner of Articulate Writing Solutions. Aliza has a range of clients in the telecommunications, cleantech and nonprofit sectors. Working in partnership with graphic designers and web programmers, Aliza offers clients a “one-stop-shop” experience that includes a professional approach to content, functionality and design. Read more about Aliza online on LinkedIn or Twitter at @alizaisrael. HireAHelper.com helps people compare and hire local movers in the USA. If you want Aliza Israel to win, share this article with your friends. If you liked this article, you'll also enjoy Become An Expert in Web2.0 Job Search Marketing. Subscribe to JobMob via RSS or email and follow me on Twitter to stay on top of new trends for job hunters. Aliza’s article is excellent. It really awakens us to update our way of thinking. I like her numbered headings- it helps to focus on the topics. The cartoons add a lot to make the reading enjoyable.